You have likely landed on this page because you need VoIP troubleshooting support. Perhaps you are having trouble with call quality issues and you are struggling to get support from your service provider. We have been in existence since 2004 so we have received thousands of emails asking for help over the years. We have compiled some useful VoIP troubleshooting tips for you based on some of those cries for help. Note that these VoIP support tips are mainly aimed at residential customers since that is where there tends to be the most issues mainly because of experience with technology and limited support from the providers in question. Businesses tend to have less issues though some of these tips do apply to businesses as well. Need a refresher on Voice Over IP first? Take a look at our basic guide and/or our advanced guide. Please add a comment at the bottom of this page if any of these troubleshooting guides help you fix your problem or if you have additional tips to add. We have focused on the main issues that people come up against, namely connection issues and call quality problems. Connection Problems -> No dial-tone, terrible call quality etc. Call Quality Problems -> Echo, hum, static noise in background etc. It is important that your setup is correct and this alone can fix many of the connection and call quality issues you may come across. Below you will find a typical setup diagram for VoIP and is similar to what you see on all the provider's websites. The connection to the Internet is usually either through your DSL or your cable modem depending on who your Internet Service Provider (ISP) is. The problem with this is that it is a little too simple, most homes these days have other devices in the setup such as wireless or wired routers, Ethernet switches, multiple PCs (and tablets). This complicates matters and can have an influence on how to connect your VoIP adapter (often referred to as an ATA - Analog Telephone adapter). We always recommend connecting the ATA to the Internet modem using the WAN (Wide Area Network) socket on the ATA (sometimes this is just called Ethernet or Internet depending on your ATA) and then having everything downstream from there. Note that downstream refers to the path from the ISP down through your Internet modem, and all the way to your computer. If you have a router or switch, connect them to your ATA on the LAN side (Local Area Network). This ensures that the ATA can prioritize the data so if you are on a phone call it gets higher priority than the Internet data from your PCs and tablets. This alone can often fix call quality issues and indeed connection issues. The term used to cover all of this is Quality of Service (QoS) and you will often hear about this when technologists talk about Voice over IP. An example of such an ATA device is the Grandstream HT502, which has a WAN and LAN port so can be easily configured as per the setup highlighted above. There may be occasions when you need the ATA to be downstream from your router. If you need to do this make sure you read the users manual for your router to ensure you prioritize data from your ATA. An example of this setup would be an integrated Internet modem and router since your only option here is to place your ATA downstream from there. Another example would be the ATA that you actually use, for example the popular Linksys PAP2T only has one Ethernet socket so you have no option here but to place it downstream. For the setup shown above, 2 Ethernet ports are required. Sometimes the router lets you adjust the QoS for voice traffic or may even be automatically set this way which makes this exercise simple but others may require you to enter the MAC address of your ATA device to prioritize that traffic. There are many ways to do this as it depends on your router so this is beyond the scope of this support guide. One other complication when your ATA is downstream from a router is that the router may not actually let the voice traffic through due to the built in firewall. Keep this in mind if you are not getting a dial-tone as you may need to configure your router to allow the ATA traffic to pass through. We recognize that there are many variables at play for setup so for this reason we created a VoIP setup guide to help with any scenario you may come across. Note: When you change your setup it is advisable to power down your Internet modem and ATA. Then power up your modem and once it is running power up your ATA. The modem will usually then provide the ATA device with an IP address which it needs in order to connect with your provider. If you are having issues where your phone service not working, simplify your configuration as much as you can for troubleshooting. First verify that your Internet is up though presumably that is a given since you are viewing this page! Remove your PCs from your network and just connect your ATA to your Internet modem and your phone to the ATA. This removes a lot of variables from the problem at hand. Your regular phone connects to the ATA box RJ-11 socket (usually marked as Phone1). If you are having issues try a regular wired phone for VoIP troubleshooting purposes, again to simplify the problem at hand. Most people at home use cordless phones these days and it works great but if you are having issues we always recommend connecting up an old analog wired phone first. Cordless phones are best to use for your setup once it is working as it easily enables you to add multiple phones in your house. Some people want to use their existing phone wiring in their house when they move to VoIP. This can be fine though not recommended unless you have some electrical knowledge. Why? Well even though you may no longer have a traditional POTs landline service with AT'T or Verizon the wiring still runs to your house and it is electrically powered. If you ever had a power outage in the past, you may remember that you could still make phone calls. This is because the local phone provider powered the phone line for you so you could still make calls in the case of an emergency. Even though you no longer pay them, this power still runs on the line into your house and this can be catastrophic for your ATA if you then connect it to the phone wiring in your house. To get around this you need to disconnect your phone wiring at the Demarcation point in your Network Interface Device (NID). This is usally a gray or black box on the exterior of your house. You may want to talk to an electrician if you want to go down this path or do it yourself but use a telephone line tester to verify there is no voltage coming into your house before connecting up your ATA. Like we said earlier, cordless is our preferred option here or a single phone connected to your ATA if its physical location in your house works for you. You may also be interested in an article we wrote on VoIP and having multiple phones. Still no Dial Tone with VoIP? If you are still not getting a dial-tone it is worth contacting your provider (via a cell-phone!). However, a couple of quick things to check. If you have the recommended setup described above you should see what the lights are doing on your ATA. For example, on my Grandstream HT502 ATA device at home I have 5 lights on the front of the device. The power light is ON when powered. My WAN (Wide Area Network) light is on because my Internet modem is serving it with an IP address using DHCP. My LAN (Local Area Network) light is on because I have router downstream from it and my ATA is serving it with an IP address. The phone lights do not come on until I pick up my phone handset and then it stays on until I put the handset back down. If I have no Internet connection to the outside world (for example if Comcast has an outage) then when I pick up the handset it says "Device Not Recognized". Each provider and ATA may say a different message but you get the idea. When the Internet connection is restored, I hear a dial tone when I pick up my handset. Also verify that you are using the correct cables. Usually the provider will give you an Ethernet CAT5 type cable when they send you the ATA. Best to use it and if you need something longer make sure you get the same kind of cable. Most work but it can be an issue if for example you use a cross-over cable. This is unlikely and most ATAs can actually handle this these days but the important part here is to use the correct cables. If you are having constant or intermittent quality issues with your calls first check your VoIP setup against our recommended setup described above. This will often fix many quality issues you may be having with your incoming and/or outgoing calls. We recommend you run our Internet quality test tool. This will often highlight any issues you may be having with your Internet connection. It is advisable to run this before you connect your ATA box - in fact it is advisable to run this test before you sign up. If your Internet is not good quality your audio will always have issues. It is important that you have a decent Internet connection for voice - remember Voice over IP service is using the Internet for all of your calls now which is one of many reasons why it is so low cost. It is using up bandwidth on your Internet connection and because it is voice, it requires that there be low latency and jitter for the connection to ensure good quality calls. If your bandwidth is limited or if there is a lot of delay for your Internet traffic to reach it's destination, or if this delay is inconsistent (jitter) then your call quality can really suffer. For example, VoIP does not work well with Satellite Internet at this time of writing, mainly because of the latencies involved for the data as it travels to and from the satellite which can make your calls sound poor quality. After running the test take a look at the summary results and the explanations. It is NOT a YES/NO result as there are a lot of variables at play but can help determine if your Internet connection is good enough - it usually is nowadays by the way. An example of a very decent test result summary can be observed below. This was taken from my home connection. Bandwidth is rarely an issue unless you are running voice and lots of data at the same time from your PCs etc. If you are having bandwidth issues it will usually be on the uplink side (your house to the Internet Service Provider - ISP) since normally it is asymmetrical and less bandwidth is available on the uplink. A clue that this may be an issue is that you can hear the other person on the call fine but your voice is poor quality to them. One potential way of getting around this is to change your codec settings for your ATA. The codec is responsible for compressing and decompressing voice traffic so it takes up less bandwidth but is still good quality. If you do more compression (e.g. G.729 standard at 8kbps) there may be a slight degradation in call quality (unlikely to be noticed) but the advantage is it will take up less bandwidth so you may actually get better quality calls. On the flip side if bandwidth is great for uplink and downlink you could compress the voice less to improve call quality (e.g. G.711 standard at 64kbps). These settings are usually performed by the service provider - you can do it but there are so many different ATA devices we cannot cover them all in this guide. Jitter, packet loss and MOS scores are very important elements here at determining call quality and consistency so pay close attention to them when you run the test. Feel free to read another article we wrote related to packet loss and intermittent audio, it may be useful. We have most likely all come across echo at some point in our lives. The most usual cause of VoIP echo is when your volume is too loud on your phone. The volume coming out of your ear piece on your phone or indeed speakers if you have them is too loud and is then getting picked up by your microphone on your mouth piece. This is a classic echo and is very annoying. Turning your volume down will fix echos most of the time. You may occasionally hear a hum or static on the line or some other form of interference. Perhaps this is constant or it may be just occasional but regardless it can be very frustrating. First of all, are you using a cordless phone? Try connecting a regular wired phone to your ATA box to rule out wireless interference. Cordless phones typically run at 2.4GHz and 5.8GHz so are high frequency but share their wavelengths with wireless devices such as routers and tablets. In the case of 2.4GHz, your microwave oven may run close to this. For those reasons, we need to rule out this form of interference. Once the cordless phone has been ruled out as being the source of the problem it is time to address some other common noise problems. At this point it also may be worth reviewing the recommended setup described above. For example if you are using the phone jacks in your house and did not remove the wiring coming into your house at the demarcation point you could be seeing issues due to the power line driving your ATA box. Do you have an alarm system in your house especially if it has been there for a few years? Alarm systems are designed to call out when an intrusion occurs and the older ones were designed for legacy landline systems using POTs. If you have an older system it may not play well with VoIP and your ATA may be having issues with this connection if you are using the internal wiring in your house. On a similar subject, we are making an assumption here but make sure you have no old legacy dial-up modems still connected to phone jacks in your house if you are using internal wiring for your setup. Finally, make sure you are using the correct power supplies for your ATA and Internet modem and ensure that there are no high powered sources near those devices. Electromagnetic Interference (EMI) from adjacent high powered devices could be getting picked up by your ATA and this interference can cause background static type noise. If you are still experiencing background noise, it is worth contacting your provider, it could be that there are internal problems with your ATA, though this is rare. If you have a ATA from a previous provider (or an IP phone) AND it is compatible with your new provider you could re-configure it and try it. There are a number of steps to this and should only be done by those that are technologically minded. Your provider will typically have instructions on their website for configuring your own device - this is often referred to as BYOD (Bring Your Own Device). Hopefully some of these tips helped you get to the bottom of your VoIP problems. Feel free to leave a comment or question below. For VOIP applications my router only allows upstream QoS. Why not downstream too? 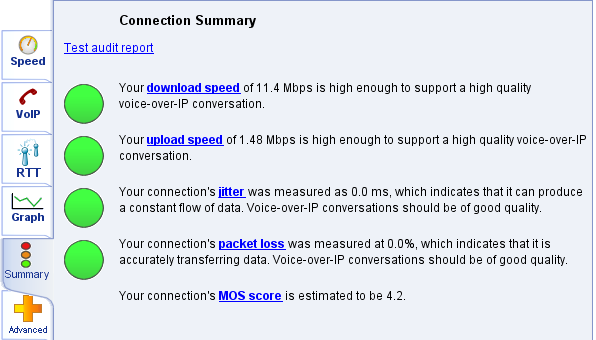 -> Response: That is a little unusual, my router has both directions for Quality of Service. However, depending on your Internet provider, upstream may well be the important one. After all, for most Internet services the upstream has less bandwidth than downstream hence the reason QoS is important in that direction. I have DSL service. We have Magic Jack. Inbound phone quality is fine, but outbound the signal breaks up so bad that the person I called can't understand me at all. It worked ok at first, but after a couple of years it got really bad. QUESTION: can I be assured that any of the companies you list will be any better? -> Response: Do you know what speed you have for downlink and uplink? Also have you tried stopping all other devices on your home Internet and just have MJ running (in case you have software running on a pc for example that is hogging all of your uplink bandwidth)? Often Internet speed is asymmetrical so uplink is lower speed than downlink (uplink is your issue here). Also try running our voip test and let me know what the results are. I would not look at any other provider until you know your Internet and setup is good enough for VoIP. We are experiencing a 4 to 5 second delay between answering a phone call and the ability of the caller to hear us. OOMA blamed it on excess jitter for the Internet (we use Time Warner). Your test indicates our jitter is not an issue. Any suggestions as to what is causing the delayed response? -> Response: I don't believe jitter would cause this. I would temporarily disable router/firewalls capabilities on your network as a test. If the delay is still present it would suggest an issue on Ooma's routing. -> UPDATE: After some conversations with Richard I suspected the router was causing issues. He reset the router and the Ooma box and now everything is working as expected. I have two separate phone lines in my house. They should be connected together so that I have only one line. One phone line works OK, but the other line is dead. Some of the phones in my house are dead, but some lines work. Any suggestions? -> Response: First I assume you are talking about VoIP rather than a regular landline, yes? Also did you disconnect the service at the NID box on the outside of your home if you are using internal wiring - see this article. We find cordless phones to be the best way to share one line. Just phone your provider and cancel the second line and save some money. I pulled the power from my SPA2102 to reboot and no lights appear and no phone service. I checked power from transformer and it shows 5.3 volts, I assume the Linksy phone modem died? -> Response: The power input is 5V for the SPA2102 so the wall plug/transformer is doing its job. It does sound like the device may be broken if you are not even seeing a power light. Worth trying again, make sure the power jack is all the way in. I'm trying to use BasicTalk with a Panasonic cordless phone through my ATT U-Verse internet provider -- call quality is sometimes clear but usually garbled on both ends -- should I give-up and rely on cell phone only? Or is perhaps the modem/router (ATT provided) set-up incorrectly? -> Response: Don't give up Dave. Please run our VoIP speed test highlighted on this page and let us know your results. It is likely a setting in your AT&T box that needs updating, most likely QoS (Quality of Service) which ensures your voice gets higher priority than anything else. My assumption here is the AT&T box is a modem/router combo. My voip is working fine but I get problems connecting to my work phone and try to log into its voicemail. -> Response: Sometimes this can be due to DTMF (Dual Tone Multi Frequency) problems. Couple of things to try here, run our speed test and check for packet loss issues. Get the provider to change the codec to G.711 or something like that where less compression. Also the provider may be able to change the settings for the VoIP DTMF tones to in-band rather than RFC2833. Some people have had success with this. Thanks for the tips! I am getting less call problems now that my voip adaptor is plugged in to my comcast modem....i used to get problems with my phone when my kids were on the computer. -> Response: Glad we helped Karen.